This is the weekend that celebrates Europe's cultural heritage...Journees des europeen patrimoine. Begun in France in 1984, one weekend in September is now set aside throughout Europe for citizens to visit chateaux, churches and historic buildings normally closed to the public. Museums offer free or reduced rate entrance; many places give guided tours or do on-site demonstrations of old skills and crafts. I've posted this photo from the website Chateaux des France because I visited this chateau in Cabrerets on Saturday. I wasn't able to take a photo of it that shows it at its most beautiful. 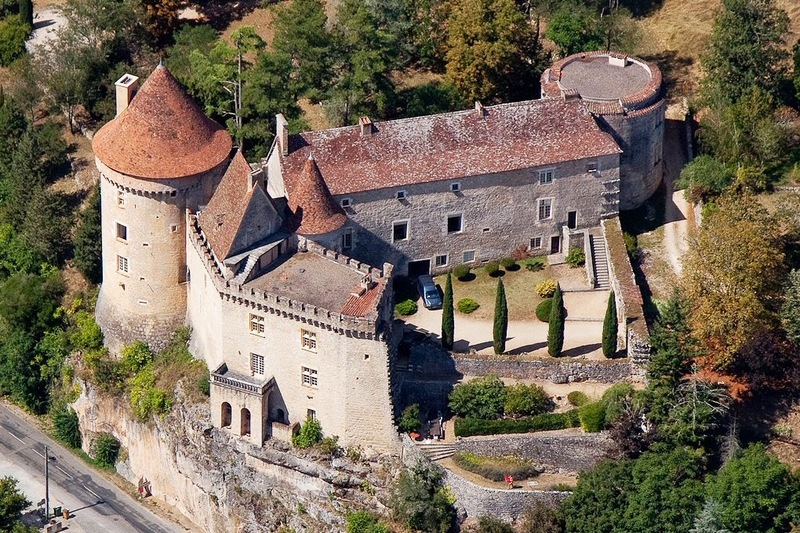 Because of its location and surrounding terrain, this aerial view best showcases its size and its unique corner turret. In the next few days, I'll be showing you more of this chateau as well as three other historic sites I visited this weekend. It has been two days of serious dipping into France's cultural heritage!